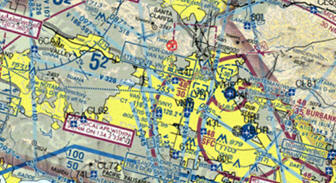 December 10, 2015 - The FAA as issued a Notice to Airmen (NOTAM), 5/3842 to alert aircraft pilots of the potential hazards of a methane gas leak at a Southern California Gas Company’s (SoCalGas) Aliso Canyon storage facility in the Santa Susana Mountains and that a no-fly zone has been put in place. The NOTAM which was issued on December 09, restricts pilots from flying aircraft within a half-mile radius of the site, (PORTER RANCH, California near VAN NUYS VOR/DME (VNY)) and extends up to 2,000 feet above the surface. The NOTAM was issued out of fear that pilots could experience health problems if entered into the airspace and that aircraft flying over the area could ignite the gas. Allen Kenitzer, an FAA spokesman said he believed the order was requested “out of concerns that the fumes from the gas leak could be ignited from the air.” Methane gas is extremely flammable and can form explosive mixtures with air. In a statement by SoCalGas, they reported the no fly zone was issued over the area “due to heightened media interest in the area, and out of an abundance of caution.” The NOTAM will remain in affect until March 8, 2016. SoCalGas which provides methane gas service for approximately 21.4 million customers in California discovered a ruptured pipe on October 23, at one of its natural gas storage wells at its Aliso Canyon storage field. Methane gas is considered a greenhouse gas such as carbon dioxide because it absorbs the sun’s heat and in return it heats up the earth's atmosphere. The leak which is about a mile away from the closest home is reported to be spewing about 110,000 pounds of natural gas per hour. SoCalGas also reported the company would discontinue using the well when the company is able to cap the well but stated it could take months before they are able to stop the leak. The company tried to downplay the amount of gas that was leaking from the well until environmentalists from Earthworks, an environmental nonprofit shot a video on December 2 and 3rd using an infrared camera that was calibrated to detect gases. The video which was released to the public shows 50,000 kilograms (110,231 pounds) of methane gas pouring out of the ground in a cloud formation per hour. Close to 3,000 families have been requested to be relocated from the area. 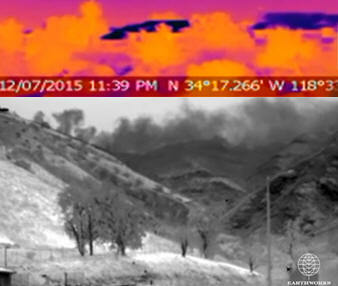 It has been reported that over 700 Porter Ranch families have been put up in hotels. Parents are calling for the school district to relocate students from two local schools, Castlebay Lane and Porter Ranch Community School until the leak is fixed. Los Angeles City Councilman Mitchell Englander said he was not buying SoCalGas “excuse” and views this as "a major national crisis".